With its roots deep in Greek mythology and the first Olympics, the bay leaf is a noble herb. Enjoy its sweet, balsamic scent and bitter/spicy bite in gravies and grain dishes, with beans and meats, and in cooking blends like bouquet garni.Frontier offers the best all-natural and organic bay leaf, powdered, cut & sifted and whole, in a variety of packaging options to suit your individual needs. 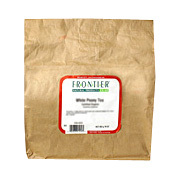 Bay Leaf Whole Organic is shipped in a discrete, unmarked package. Orders are processed immediately and usually take about 3 to 5 working days to be received. We do ask that you try it for 2 to 3 weeks to feel the full effects. Any information received is used only for order processing and shipping purposes. Your information, such as e-mail address, will never be disclosed to a third party.